Side chair with maintenance free teak effect slats and a durable 28mm diameter welded Aluminium frame. Stackable up to six high. Suitable for outdoor commercial use. Quality construction, suitable for outside commercial use. 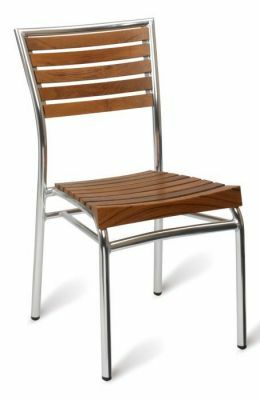 Fantastic high quality immitation teak chair for outdoor use. Please contact our sales team for further information on bulk orders.